Amid growing foreign currency debt, Standard & Poor's assesses whether depreciating currencies are a major concern for credit quality in Asean. Amid growing foreign currency debt, are depreciating currencies a major concern for credit quality in Asean? In isolation, the depreciation of a number of regional currencies is not a major credit concern. Most regional currencies have been in marked decline from their peak in 2011 against the US dollar. Still, currency depreciations are far from benign. They are becoming an increasingly relevant, and negative credit trend in the region. But that is rather because of the context in which they are taking place. For Asean companies, the external environment is now a lot tougher than in 2011-2013 and currency depreciation is coinciding with more fragile consumer confidence in a number of countries, including Indonesia, Malaysia, and Thailand. At the same time, we’re seeing capacity underutilization following years of sustained investments; a corporate debt load that is a multi-year highs since the end of the global financial crisis; and prospects for rising funding costs. In the past, currency depreciation has also affected the confidence of capital providers, who have been reluctant to extend maturities, roll-over working capital loans, or increase credit lines at moderate costs. We believe a further bout of currency depreciation will be no different this time. That’s an issue given that Asean companies still extensively rely on short-term debt funding. And, similar to what happened during the Asian financial crisis and 2009-2010, companies with a substantial currency mismatch between their cash flow and funding sources may start contemplating their options regarding their capital structure, including restructuring or distressed exchanges. We are yet to see a major default driven by currency depreciation. But currency depreciation is undeniably exacerbating increasingly leveraged balance sheets in Asean, especially for the largest companies. We believe small companies will be affected a lot more. How does Standard & Poor's view the exposure of companies to bank loans? Funding for Asean companies will remain concentrated on bank lending for the foreseeable future. We estimate more than 50% of all listed companies in Asean rely exclusively on bank loans for their funding needs, using data from S&P Capital IQ. That proportion has barely changed since 2010. Exposure to bank loans has been a supportive factor for funding and liquidity profiles. Companies generally have long-dated and well-established relationships with their historical fund providers, while bond financing exposes companies to investors that might be more fickle and sensitive to overall business confidence. But this strength could be turning to a relative weakness in the current environment. Bank funding in the region is made predominantly on a floating basis, compared with the fixed-rate nature of domestic and offshore bond markets. This exposes companies to rising interest rates, either because the base rate is indexed or quasi-indexed to US monetary policy (such as bank lending in Singapore), or because banks may start to adjust margins upward to reflect prospectively higher risks. The concentration of funding toward short-dated bank loans is another vulnerability in the context of prospective rising rates because companies will need to refinance a higher share of loans at a higher cost. What about bond funding and maturities? Bond funding will remain a secondary, albeit growing, source of funding for companies in Asean over the next two-to-three years. We estimate that bonds currently represent more than one-third of debt securities for less than 10% of all listed companies in Asean, although that proportion increases for companies in Indonesia, the Philippines and Thailand because of deeper domestic bond markets. 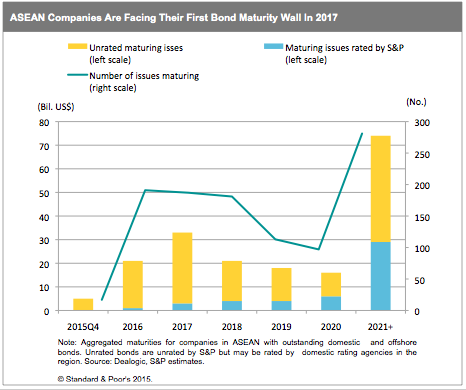 Asean companies are not facing an imminent debt-maturity wall, but refinancing requirements will be steadily growing through 2017. We estimate that aggregate bond maturities in the region will reach close to $35 billion in 2017, with close to 190 different issues maturing (see chart 1 below). That’s a big jump from about $20 billion in 2016 and about $5 billion in the last quarter of 2015 (some of which is already pre-funded). 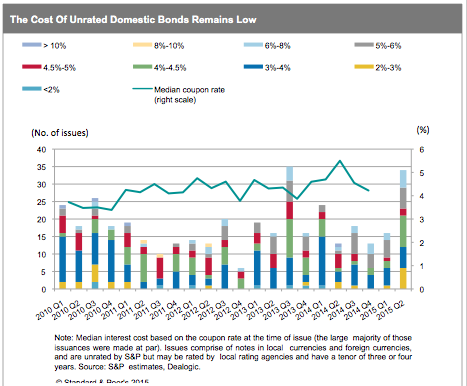 Most bonds coming due are unrated and were issued predominantly in Singapore, Indonesia, and Malaysia. Issuers raised these funds over 2012-2014 and benefited from very favorable funding costs. The relatively short tenors of bonds raised in Singapore (typically three years, compared with five years for a standard bond in US dollars) mean that issuers will need to refinance sooner -- and in a context where interest rates might have already started to normalize. What is Standard & Poor’s' view about the direction of funding costs? Overall funding costs are likely to remain comparatively attractive over the next 6-to-12 months, but we think the current low pricing environment is unsustainable. A normalization of funding costs for high-yield issuers has been taking place in the offshore bond market in the region since the beginning of 2015. But this normalization has been slow in the bank loan market, and is yet to happen in the domestic bond markets, where companies continue to raise funds at very low costs. We estimate the median coupon rate of about 4.2% and a spread over the corresponding US risk free rate of about 335 basis points for close to 400 unrated domestic bonds issues raised by non-government owned companies in the region between 2010 and 2015 and with maturities of three-to-four years (see chart 2 below). Such low funding costs is unlikely to persist upon normalization of interest rate policy in the US. Leverage has been rising across the region for the past four years, and we believe capital might have been allocated more on the basis of a relative yield rather than on the basis of credit risk. If the above coupon rates and bond yields were solely indicative of credit quality (and they are not, given they also reflect, inter-alia, market liquidity and yields on other investment alternatives), about half of companies issuing unrated bonds regionally would have credit characteristics commensurate with an investment-grade rating level, based on coupon rate and yield data on Standard & Poor’s investment-grade issuers. Given the profile of bond issuers in the region, which tends to increasingly comprise smaller companies with narrow business scope, growth aspirations, and more aggressive financial strategies, this appears unlikely. Standard & Poor's expects the Federal Reserve to start normalizing its monetary policy before the end of 2015. In late 2014, we assessed as “low to moderate” the overall impact that rising interest rates could have on the credit quality of companies in Asean. We estimated that a sudden interest rate increase of 4%-6% would affect the credit quality of up to 20% of companies in Asia, compared with about 17% of companies globally. At the time, we estimated that about 9% of companies would be affected in Indonesia, 14% in Vietnam, 15% in the Philippines, 17% in Malaysia, and 19% in Singapore and Thailand. Those estimates, however, were based on financial statements from year-end 2013. Debt has further expanded for companies in Asean in 2014, and we believe it will continue to do so in 2015. Currency depreciation is also adding to interest costs. Consequently, we believe those numbers from late 2014 now form a lower bound for things to come, given the more challenging macroeconomic and operating environment we are seeing today. The author of this article is Xavier Jean, a director in Standard & Poor’s Ratings Services’ Corporate Ratings team.